Farmer, municipal official, MLA (1950-1953), MLA (1954-1957), MLA (1958-1959). Born at Minnedosa on 28 September 1910, son of Norman P. Shuttleworth (1881-1962) and Sarah Cameron (?-? ), he served as Reeve of the Rural Municipality of Odanah and President of the Manitoba Approved Flock Owners. 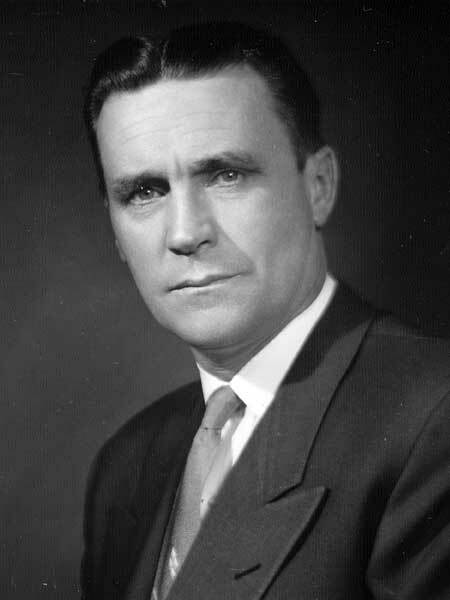 First elected to the Manitoba Legislature at the 1949 general election, he was a cabinet minister for Agriculture and Public Utilities in the government of Premier Douglas Campbell. Re-elected in 1953 and 1958, he was defeated by Walter Weir in 1959. A candidate for the Portage constituency in the 1962 federal general election, he was defeated by Siegfried Enns. In 1965, he was appointed as a member of the Canadian Board of Grain Commissioners. A major accomplishment of this tenure was a complete revision of the Canadian Grains Act. In 1972, he was appointed as the first Chairman of the Board of the Canadian International Grains Institute. On 25 September 1935, he married Charlotte May Sedwick (1912-1981), daughter of T. E. Sedwick, of Minnedosa. They had two children. In addition to volunteering at the local museum, he was an active member of the Masons (Prince of Wales Lodge), Minnedosa Rotary Club, and Minnedosa United Church. In 1982, he was presented with a Certificate of Merit from the University of Manitoba for his contribution in the field of agriculture. In 1996, he was inducted into the Manitoba Agricultural Hall of Fame. He died at Minnedosa on 13 April 2006. Obituary, Winnipeg Free Press, 17 April 2006. This page was prepared by Paul Armstrong and Gordon Goldsborough.